﻿ Fun Easy English - Environment - Global warming - Climate change Indicators: Sea Level. This indicator describes how sea level has changed over time. The indicator describes two types of sea level changes: absolute and relative. After a period of approximately 2,000 years of little change (not shown here), global average sea level rose throughout the 20th century, and the rate of change has accelerated in recent years.1 When averaged over all of the world’s oceans, absolute sea level has risen at an average rate of 0.06 inches per year from 1880 to 2013 (see Figure 1). Since 1993, however, average sea level has risen at a rate of 0.11 to 0.14 inches per year—roughly twice as fast as the long-term trend. Relative sea level rose along much of the U.S. coastline between 1960 and 2015, particularly the Mid-Atlantic coast and parts of the Gulf coast, where some stations registered increases of more than 8 inches (see Figure 2). Meanwhile, relative sea level fell at some locations in Alaska and the Pacific Northwest. At those sites, even though absolute sea level has risen, land elevation has risen more rapidly. While absolute sea level has increased steadily overall, particularly in recent decades, regional trends vary, and absolute sea level has decreased in some places.2 Relative sea level also has not risen uniformly because of regional and local changes in land movement and long-term changes in coastal circulation patterns. Changes in the volume of water and ice on land (namely glaciers and ice sheets) can increase or decrease the volume of water in the ocean (see the Glaciers indicator). As water warms, it expands slightly—an effect that is cumulative over the entire depth of the oceans (see the Ocean Heat indicator). Scientists account for these types of changes by measuring sea level change in two different ways. Relative sea level change refers to how the height of the ocean rises or falls relative to the land at a particular location. In contrast, absolute sea level change refers to the height of the ocean surface above the center of the earth, without regard to whether nearby land is rising or falling. This indicator presents trends in sea level based on measurements from tide gauges and from satellites that orbit the Earth. Tide gauges measure relative sea level change at points along the coast, while satellite instruments measure absolute sea level change over nearly the entire ocean surface. Many tide gauges have collected data for more than 100 years, while satellites have collected data since the early 1990s. Figure 1 shows annual absolute sea level change averaged over the entire Earth’s ocean surface. The long-term trend is based on tide gauge data that have been adjusted to show absolute global trends through calibration with recent satellite data. This long-term data set has been calculated through 2013, while satellite data are now available through the end of 2015. 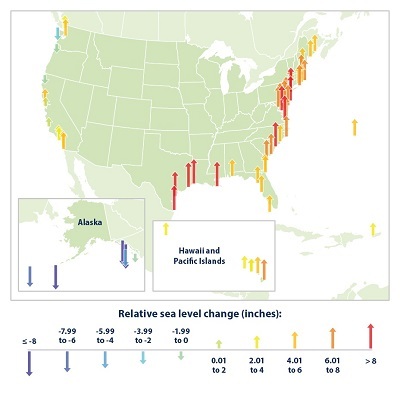 Figure 2 shows trends at a more local scale, highlighting the 1960 to 2015 change in relative sea level at 67 tide gauges along the Atlantic, Pacific, and Gulf coasts of the United States. Relative sea level trends represent a combination of absolute sea level change and any local land movement. Tide gauge measurements such as those in Figure 2 generally cannot distinguish between these two different influences without an accurate measurement of vertical land motion nearby. Some changes in relative and absolute sea level can be due to multi-year cycles such as El Niño and La Niña, which affect coastal ocean temperatures, salt content, wind patterns, atmospheric pressure (and thus storm tracks), and currents. Obtaining a reliable trend can require many years of data, which is why the satellite record in Figure 1 has been supplemented with a longer-term reconstruction based on tide gauge measurements. Absolute sea level trends were provided by Australia’s Commonwealth Scientific and Industrial Research Organisation and the National Oceanic and Atmospheric Administration. These data are based on measurements collected by satellites and tide gauges. Relative sea level data are available from the National Oceanic and Atmospheric Administration, which publishes an interactive online map http://tidesandcurrents.noaa.gov/sltrends/sltrends.shtml with links to detailed data for each tide gauge. 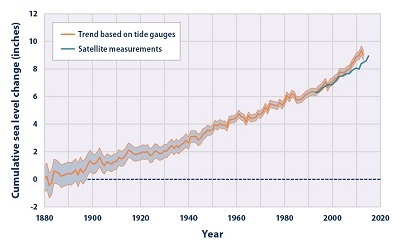 This graph shows cumulative changes in sea level for the world’s oceans since 1880, based on a combination of long-term tide gauge measurements and recent satellite measurements. This figure shows average absolute sea level change, which refers to the height of the ocean surface, regardless of whether nearby land is rising or falling. Satellite data are based solely on measured sea level, while the long-term tide gauge data include a small correction factor because the size and shape of the oceans are changing slowly over time. (On average, the ocean floor has been gradually sinking since the last Ice Age peak, 20,000 years ago.) The shaded band shows the likely range of values, based on the number of measurements collected and the precision of the methods used. This map shows cumulative changes in relative sea level from 1960 to 2015 at tide gauge stations along U.S. coasts. 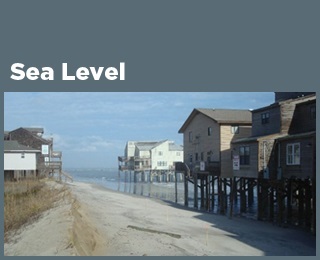 Relative sea level reflects changes in sea level as well as land elevation.